Wat do you think guys, are you ready to make your Anise jacket? From now through October, we’ll be stepping through the process of creating this jacket together. We’ll be using The Anise Companion as a textbook of sorts, and I’ll be posting some of the photos and instructions from the book here as we walk through it. You’ll have a chance to ask questions and solicit feedback from each other, and I’ll be doing my best to jump in and answer whatever comes up. We’ve had tons of people purchase the (completely optional) companion guide, so hopefully many of you will be joining us as well! And for those that aren’t, you’ll still learn plenty from this series. Many techniques are applicable to other projects, from bound buttonholes to single welt pockets to inserting a jacket lining. I’ll be posting on Tuesdays and Thursdays, starting next week. Here are some buttons for your own blog if you’d like to help promote the sew-along! Ready to go? Are you in? I already did some pre-muslin fitting, but I’m in anyway! Excited because I already had enough wool coating and lining in the stash. I’m so happy & excited by this project it’s scary! I’m in! This will be my first ever attempt at a jacket, so I’m so grateful to be getting this kind of support, it’s truly priceless! Yes. Yes, yes please. A sewalong for Anise. Im still undecided as to the main fabric. Maybe tomorrow will bring the right kind of blue. But once that’s settled, I’m all in. IT IS GETTING COLD HERE – and I cannot stand my current jacket one minute longer! I’m in. At first, I though the Anise wouldn’t flatter me. And, at my advanced age (59), I though that it might look too twee on me. I have a large bust and I worried about the length making me look like a box. But, then I found some deep purple gabardine in my stash and I started to reconsider the Anise as something I could have fun with. I have a few years on you, but I remember having a jacket so similar to this back in the sixties and I loved it. I debated when I first saw the pattern if it would look too young on me, but then I decided–what the heck–I’m going for it. I am very glad you posted–looking forward to seeing your jacket. oh man, I would be in, but i am 15 weeks pregnant! can’t really do a proper fitting I guess. I adore this coat!! This is my first sew along… I’m nervous! This pattern came out the day after I resolved not to buy any more patterns or fabric until I used up the stuff I already had. Oooops. That lasted a whole 24 hours. Can’t wait to get started! Same here! I broke my pattern buying fast, too! I’m so definitely in!! I have the pattern and the companion. Just need to decide on a fabric from my stash. Looking forward to seeing what everyone does with this. Yes! I would love to do this. I do need to buy fabric – I don’t have anything appropriate at home. ok – this might be a stupid question but can someone please tell me how to add the button to my blog? I have tried other buttons and I can’t figure it out. Sorry, I’m not that tech savy. Thanks in advance! Yes! I’ve got some gorgeous peacock blue/teal velveteen that I got especially for this. I hope I can keep up with the sew-along. I will have to do almost all my sewing when the kids are in bed for the night. i’m in! i have the companion but the pattern hasn’t arrived yet. i’m also in total fabric inertia – i can’t decide what to buy at all in terms of weight. all i can picture is thick wool which i can’t see how it would fit under my presser foot. so i am definitely going to be looking for guidance there. still i can crack on with muslin making while i decide. I am totally in! This will be my first jacket (and I am fairly new to sewing) so I bought the pattern and the companion. Very much looking forward to the sew-along! I’m all for it! I ordered my pattern on Monday so it should get to Ontario in lots of time. I’m looking forward to this sew-along. So excited to do this sew-a-long! Ok je vais tenter de le faire avec vous ! J’attends avec impatience le patron de ANIS que j’ai commandé le premier jour de sa sortie, sur votre site. Il ne devrait pas tarder maintenant. This is basically a fitted version of a jacket I already own, so I won’t be purchasing the pattern or sewing-along any time soon. However, I’m looking forward to following along, learning some new techniques, and getting inspiration for other projects! I am thinking to do a lightweight version for our upcoming spring/summer. I have some teal cotton twill set aside for this, which fits in with my larger wardrobe plan perfectly! Not sure how I’ll go keeping up with the sewalong, but I’m going to give it a go! Also, on my “Finished Garment Measurements,” it lists 3 categories of measurement, but to the left it doesn’t describe these measurements. Bust? Waist? Length? Thanks for your help, I’ll definitely be sewing along! We had some issues withe the PDF , yes! You can either discard those two pages, or just go to our shop, sign in, and click the downloads tab. From there, you can download a corrected version. We’re also going to email everyone about it. Heck yes I’m ready! Here’s to hoping my pattern arrives in time… Fingers are crossed! I’m so, so excited. Waiting for the fabric I bought on-line to get here… it’s pink! I ‘m in! Already have my pattern at home, bought fabric..little bit confusid about the interlining I need to use..Do I need to use muslim or is it also possible to use fusible interfacing? You can use interfacing if you like. My first Anise was interfaced and had a back stay instead of underlining. I like the support and simplicity of the full underlining, but there are certainly alternatives that also look great! Going to look for fabric tomorrow! Thank you for the sewalong! I’m in! This will be my first complicated clothing project and I’m excited but nervous at the same time! I am in- for my first jacket and for my first sew-along! I hope I will be able to finish it! I downloaded the pattern and the companion- I am going to put it together and cut my size in the next days. I have a couple of fabrics in mind from my stash.. not decided yet…I am very excited! Yipee! I just bought my pattern and have a great cut of wool i’ve been hoarding for the perfect project! What the heck, I’m in. I just hope I can use the cotton twill and cotton lining fabric I already have. And I may be adding some length. I’m excited to get started. I bought my fabric today. Where does one buy fusible weft interfacing? One line it is 10 per yard. That is pricey. Okay! I’ll do this. I haven’t done a sew along, and haven’t sewn a lined jacket in about 25 years! I already have the pattern…. Ready, set, sew….. I won’t be sewing an Anise right now (I’m kind of broke, a bit scared of jackets and I have another sewing project to complete for a special someone) but I love this jacket and I think I will make it someday, so the sewalong is going to come in handy anyway! Thanks! I am excited to try a jacket for the first time. I am determined to make sewing a priority so that I can be confident enough to sew myself a dress for my sister in laws wedding next summer. Lots of time to practice between now and then! Is it just me, or does the button not seem to be working? May be that the link to the picture was broken? Christie, I’ll look into this ASAP. The button is fixed now. No need to update your code. Sorry about that! I’m in! This will be my first jacket and my first print-at-home pattern. Really, my first sewing in a while – but I’m very excited! I’m in, I also broke my buying fast that has lasted for 2 years to basically buy all of her patterns! I am totally excited and shopping my stash for fabric, etc. This will be great! My first jacket and first taste of tailoring. I have my wool already, and ordered some silk lining which arrived Friday. Yesterday I measured my victim, er, model… :) I’m making it for my step daughter who is a tiny little thing (use less fabric was my thought) and she is happy to receive a coat in return! So, I’m ready to go :) Thanks for the SAL!!! When I saw this sew-along I got very excited and immediately purchased the PDF pattern and the Companion. I also started a blog to chronicle my progress. I’m thrilled to have a chance to participate in this sew-along and learn some fitting and tailoring skills. What is so fortunate I’ve got the perfect wool suiting in my stash to work with this jacket! 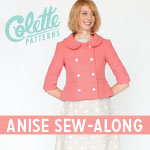 oooOOoo very excited, I had this pattern on pre-order from my lovely Colette Pattern stockist (www.sewbox.co.uk). I just completed my Lily dress, still have my Clover trousers to do (printed the sew a long out) and my Rooibos oh and about 3 other colette. So UNDECIDED on material ! just can’t make up my mind !! I have some orange garbadine, so might make it with this as a first attempt !!!!! I am sew (hahah) excited I am like a puppy !! I am even thinking of bloggin my progress ! Can i have some sizing advice please having never used one of your patterns before- do I go withmy actual bust measurement [88cm/34″] or base it on the finished garment size measurements which would see me do a smaller pattern size? Be great if your patterns and yardages were also in metric for those of outside the USA. You should choose a size based on your actual measurements. The finished garment measurements include the ease in the pattern. We’d love to at least include metrics in the downloads and online. Unfortunately, they would never fit on the pattern packaging, which is why they’ve never been included. Thanks for the feedback! Ordered the Anise and so pleased there will be a sewalong for it. Hoping my pattern arrives over here in Oz soon so I can join in the sewalong. Thinking I might make it in a light weight something something, (maybe linen?) as we are heading into summer. Depends what I find when I go fabric shopping next week. Anyhow, I’m in. Yayyyyyy. Just purchased the Anise and ebook – looking forward to sewing out this jacket together!! hi… um.. maybe I’m really silly and you won’t want me to join in but I can’t see where I start to follow and sew along with you? I’m sorry but my time is wayto valuable to spend tracing a pattern when you can buy them for $2!!! There are always lots of specials on patterns and if you wait for them, you’ll save so much time. Time that is wasted (in my opinion) tracing patterns! I am a very beginner, but I believe in challenges. I finally got the courage to purchase this pattern and I will try to the best of my abilities to follow thru this sewalong.